Unfortunately, the history that seems to stick in the mind is oversimplified beyond belief. Although jazz is a reasonably young phenomenon, it has attracted too many watery half-truths. When enthusiasts began to write about the music and its performers in the Thirties, they were so in love with what they heard that they created and embellished myths appropriate to its magical, transporting nature. Perhaps we have come some distance from Buddy Bolden’s cornet being heard miles away and Bix Beiderbecke carrying his horn in a paper sack, but the myths have been maintained tenderly for decades. Closely examined, these cherished bits of apocrypha turn out to be dangerous rather than dreamlike. In his new book, musician, harmonic theorist, and writer Randall Sandke (we know him as Randy) has done a magnificent job of spring cleaning jazz’s mythic house, writing truths others wouldn’t. It might be the only book of its kind; it needed to be written. More to the point, it needs to be read. Sandke is angry, but his is a righteous indignation. The book isn’t his story of how badly he’s been treated, but a wide-ranging evidence-based study of the distortions that pass for received wisdom. His goal is to point out the fallacies, inconsistencies, and contradictions that have become jazz history (and by extension, the curricular truths on which jazz education has been built). He can be sharp-tongued, especially about biased statements made by people who don’t play instruments — but the book is not a vindictive jamboree. What Sandke is particularly unhappy about are attempts to portray jazz as a racially divided music, where African-Americans took their inspiration directly from Africa (where else?) and brought it to America only to have it stolen by greedy, ignorant Caucasians who copied their innovations, ran record labels and jazz clubs. Jazz, to Sandke, isn’t Black music popularized by White men: it is a musical continuum where Ornette Coleman can speak sadly about young “Scotty” LaFaro, his favorite bassist, where Louis Armstrong and Doc Cheatham can speak reverently of Bix Beiderbecke. The musicians know that the notes are not connected to skin pigment. The critics, Black and White, have not gotten that point. And the writers who have, intentionally or through ignorance, nurtured alsehoods are famous — Rudi Blesh, John Hammond, Hugues Panassie, Albert Murray, Stanley Crouch, Marshall Stearns, Amiri Baraka, Martin Williams, Gary Giddins. What Sandke wants is fairness, not music being distorted to serve anyone’s ideology. He wants readers to know the reality of the music business — something he’s learned from experience on the bandstand and off — and to examine how race applies to jazz, which it certainly does. He wants us to know what musicians were paid in different contexts from New Orleans gigs to current festivals. He would like us to think deeply about the problems of “authorship” — when a composition was re-copyrighted under a different title, when such august figures as Clarence Williams made money off more credulous younger players, one being Louis Armstrong. And he poses philosophical questions without being didactic, merely by positioning first-hand narratives side-by-side, so that we are asked to think about Duke Ellington’s taking the ideas his musicians brought to him and making hit songs out of them, adding his name . . . and the same process done to those compositions by Ellington’s White manager Irving Mills. Many readers will be drawn to Sandke’s careful yet impassioned examination of what he calls “the Wynton Marsalis phenomenon,” giving Marsalis credit as a player and influential figure but taking issue with the social and poitical implications of his elevation to a primary role as jazz’s sole figurehead. But Sandke is not out to win notoriety by attacking Marsalis, as will become obvious even to the most Marsalistic of readers. 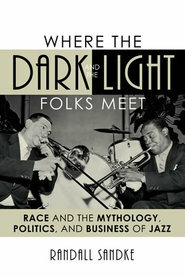 Sandke also works hard to remove the mythic accretions of decades in favor of first-hand narratives: the racial balance in the recording studios; the complex and sometimes painful relations between musicians and record companies, managers, and promoters, and the role of White listeners as essential to the survival and continuation of jazz. For jazz, he sees a hopeful future — that is, I think, if much could be left in the hands of the musicians rather than the ideologues. This book will be greeted with some dispeasure. Sandke is Caucasian; he will be seen by some who do not read his book closely as writing as a jealous, disgruntled outsider. He does portray some musicians and writers, living and dead, as unfair, hardly objective. But five pages of his book will easily dispel any sense that he is acting out of acrimony. Those tempted to call him racist will have to ignore the evenhandedness on every page. And — to back away from disputation for a moment — Sandke is a fine literate plain-spoken writer. The book is heroically researched without being dull or stodgy. And it comes to seem a series of brief interconnected essays on the larger theme, essays that can successfully stand on their own. I dream of an upper-level jazz course for musicians as well as educators that would take each essay as a seminar text: perhaps some perceptive university will offer Professor Sandke a steady Tuesday-afternoon gig. Ultimately, it all comes back to the book’s title. Jam sessions and jazz clubs have long been places where dark and light folks met in joyous exploration, creative harmony. Eddie Condon was arranging “mixed” record sessions long before this country could accustom itself to the possibility of Barack Obama. Jazz, rather than having been the reactionary, nearly moribund phenomenon some of its critics see it as, could still be the vision of a loving collective world. Now, that’s hopeful!